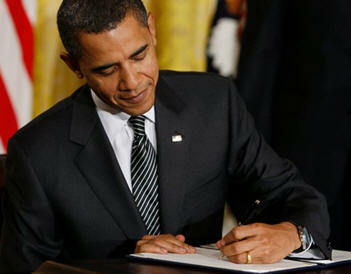 February 15, 2012 - On Tuesday President Barack Obama signed the FAA Modernization and Reform Act of 2012 (H.R. 658) which will modernize the nation's aviation system. The law will provide $63.4 billion in FAA funding over four years, including about $11 billion toward the modernization air traffic control system. This bill will allow the FAA to rebuild its air traffic control system to the next generation technology which will include switching from radar to a GPS air traffic control system. The law will open up the skies to unmanned drones by September 2015. John Mica, chairman of the House Transportation and Infrastructure Committee sad, "This critical effort to shift from our antiquated air traffic control technology to a GPS-based system will improve air traffic efficiency and safety, reduce fuel burn and pollution from aircraft, and bring costs down for consumers." The president of the National Air Traffic Controllers Association, Paul Rinaldi, praised the new law. "This new technology will help reduce delays, give controllers better tools with which to perform their jobs even more efficiently and provide a platform for further technological and safety enhancements." The Coalition of Airline Pilots Associations, which represents over 28,000 commercial airline pilots, applauded the passage of an FAA Reauthorization Bill, ?While still trying to understand how exempting the most fatigued pilot group, the all cargo pilot from the new Flight Duty and Rest Regulations enhances aviation safety, we are now faced with battery regulation that doesn?t adequately safeguard our cargo pilots,? said Captain Carl Kuwitzky, president of CAPA. The Bill prevents the FAA from mandating tighter controls on lithium batteries beyond International Civil Aviation Organization (ICAO) Technical Instructions unless U.S. or foreign air-accident investigators produce ?a credible report? that lithium batteries ?substantially contributed? to an aircraft fire. The Aeronautical Repair Station Association witch represents repair stations and the airlines is happy to see the rewrite of the law which will not require overseas maintenance facilities to drug and alcohol testing of their employees and not faced with biannual inspections. ?The earlier versions of the bill would have added new layers of bureaucratic oversight and increased costs for repair stations and airlines with no improvement to safety.? Air Line Pilots Association (ALPA) stated ?While ALPA would have preferred that the extraneous provision regarding National Mediation Board elections had not been included in the FAA reauthorization, a compromise agreement was necessary to allow the bill to move forward. The FAA reauthorization signed by President Obama protects the National Mediation Board rule change, which ensures that only actual votes cast in a representation election are counted. The law does not include any reference to decertification or judicial review nor will it change the way ALPA conducts its elections.?
? Advancing NextGen ? U.S. Air Transportation Modernization, establishes deadlines for adopting existing NextGen navigation and surveillance technology and mandates development of precision navigational procedures at the nation?s 35 busiest airports by 2015.
? Enhancing Runway Safety - Directs the FAA to develop and implement a plan to improve runway safety by reducing the number and severity of runway incursions and requires a plan to develop and install a system to alert pilots and controllers of potential runway incursions.
? Making Laser Attacks on Aircraft a Federal Crime - Expressly makes shining a laser pointer at an aircraft a federal crime, achieving a major component of ALPA?s action plan to safeguard the skies from laser attacks on aircraft.
? Applying Flight and Duty Time Limits to Tail-End Ferry and Maintenance Flights - Counts flight segments to reposition aircraft that may be added to the end of a pilot?s duty day toward flight-time limits by including Part 91 flights in flight-time limits under FAR 121.
? Improving Safety of Lithium Battery Shipments by Air - Gives the U.S. Department of Transportation the ability to regulate the air transport of lithium metal and lithium ion batteries more stringently than the International Civil Aviation Organization (ICAO) technical instructions based on ?credible reports? of safety incidents attributable to lithium batteries.
? Continuing to Authorize Transpacific Alternate Airports - Keeps the alternate airfield open on Midway Island, as well as airports in the Marshall Islands, Micronesia, and Palau, all of which are vital to safe long-range flight operations.
? Strengthening Voluntary Aviation Safety Data Protections - Enhances protections for data collected by the Aviation Safety Action Program, the Flight Operations Quality Assurance Program, Line Operation Safety Audits, and Safety Management Systems and voluntarily submitted to the FAA by mandating that the data cannot be released to the public unless it is completely deidentified.
? Studying Feasibility of Installing Flight Deck Doors or Alternatives on All-Cargo Aircraft - Takes important action toward goal of enhancing all-cargo safety and security by funding studies on the feasibility of adding hardened cockpit doors or alternatives to all-cargo aircraft.
? Opposing EU Environmental Trading Scheme for Commercial Aviation - In the legislation, Congress made clear its sense that the European Union should not extend its emissions-trading proposal to international civil aviation operations without working through the International Civil Aviation Organization.
? Supporting Critical Aviation Safety Research - Directs the GAO to study the effectiveness of the FAA?s oversight of the use of new technologies to prevent or reduce danger from smoke in the cockpit. Supports weather research on icing, volcanic ash, and wake vortices. Continues authorization for research and development in areas of fire safety, airworthiness, aircraft catastrophic failure prevention, human factors, aeromedical, unmanned aircraft systems, Safety Management Systems, atmospheric hazards, airspace management, propulsion and fuel systems, and alternative jet fuel.
? Expanding IRA Rollover Options for Airline Employees During Bankruptcy - Expands choices for qualified airline employees who receive payments during airline bankruptcies to allow the funds to be considered an IRA rollover contribution. On Friday President Obama signed H.R. 3801, the Ultralight Aircraft Smuggling Prevention Act of 2012, in the Oval Office. This bill was the last piece of legislation that former Representative Gabrielle Giffords sponsored and voted on in the U.S. House of Representatives. Vice President Joe Biden, former Representative Giffords and her husband, Mark Kelly attended the signing ceremony. President Obama said ?This bill gives our nation?s law enforcement expanded authority to combat illicit drug trafficking on our Northern and Southern Borders and being able to sign it next to my friend Gabby Giffords gives me enormous pride. She has spent her career fighting for the safety of the people of Arizona and the fact that it passed unanimously shows just how much Gabby is respected by her colleagues in Congress in both parties.